It all begins when Ana Watson’s little brother, Clayton, secretly ditches the quiz bowl semifinals to go to the Washingcon sci-fi convention on what should have been a normal, résumé-building school trip. If slacker Zak Duquette hadn’t talked up the geek fan fest so much, maybe Clayton wouldn’t have broken nearly every school rule or jeopardized Ana’s last shot at freedom from her uptight parents. I may be a book nerd, but I’m definitely not a geek. 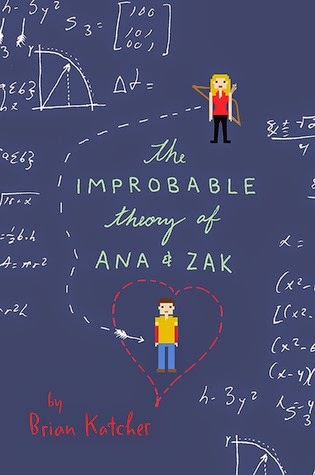 There were so many references throughout The Improbable Theory of Ana and Zak that I did not understand. However, there were still quite a few that I did get or at least recognize where they came from. Ana and Clayton’s parents are super strict. Ana has constantly been afraid of messing up ever since her sister was kicked out the house because of an unplanned pregnancy. After Clayton takes off for the convention, Ana must track him down before their chaperone and parents find out he’s gone. Zak is only participating in the quiz bowl because the teacher made a deal with him. He could pass her class and not have to take summer school if he came along as an alternate. Easy deal, right? Zak thought so until he learned the competition fell upon the weekend of his beloved convention. Ana and Zak are sent on a crazy adventure at a comic book convention while searching for Ana’s missing brother. Even though I’ve never been to one myself, I could easily picture the massive crowds and crazy outfits from pictures I’ve seen and stories I’ve heard. The adventure itself is hilarious. Ana and Zak get caught up in so many insane hijinks; they really do have the worse of luck. Some of the events are really unrealistic, but that’s what makes it funny. I did think the romance between Ana and Zak was super cute. Even though they come from two different worlds, they do have more in common then they first realize. I liked how their relationship developed over the course of the long, crazy night. Overall, I thought the book was really funny. I think I would’ve enjoyed it more if I was into these kinds of conventions and was able to understand more of the references.